Some people seek out fame, others have it thrust upon them. Then there’s Erasmus. In most great movements in history, there are those largely overlooked because others made more noise (or had better press secretaries). The Reformation is no exception. Most of us will immediately think of Martin Luther, but if you were to ask those in the Catholic Church at the time they would tell you that Luther merely "hatched the egg that Erasmus laid." 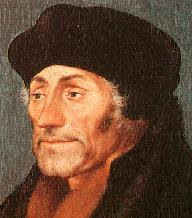 Erasmus was likely born in Rotterdam somewhere around the year 1466. (We’re not quite sure.) In 1492 he was ordained to the priesthood and soon after he went on to study at the Unive rsity of Paris, in the Collège de Montaigu. While there he quickly developed a reputation as an accomplished scholar with a very personable style. His wit and demeanor were so well admired that even kings would wait patiently while he took time to formulate the answer to a question. In 1511, he published In Praise of Folly, a satirical look at the traditions and popular superstitions of the Catholic Church. It was well received, even by Pope Leo X, which at first pleased Erasmus greatly and added to his ever increasing fame. But the day would come when he would regret ever having written it. A few years later, he published a Greek New Testament. For centuries, Jerome's Latin translation, the Vulgate, was the Bible of the Church. However, Jerome's translation had deficiencies. Erasmus reconstructed the original New Testament as best he could from Greek texts. What’s more, he included more than a thousand notes that pointed out common errors in interpreting the Bible, criticizing among other things, Rome's refusal to let priests marry (especially since many cardinals and even popes lived openly with mistresses), prayers to the saints, indulgences, relic-worship, and the all-encompassing power of the pope. In an effort to sooth ruffled feathers, he dedicated the edition to Pope Leo X himself, and assured the pontiff that..."We do not intend to tear up the old and commonly accepted edition [the Vulgate], but amend it where it is corrupt, and make it clear where it is obscure." The problem was, someone else was also impressed with Erasmus’ work – namely Martin Luther, and many other Reformers. In their attacks on the Roman Church they began to quote Erasmus liberally. His Greek New Testament was the one Luther used in creating his German Translation. And, in truth, Erasmus and Luther started out as good friends; but when Erasmus refused to join the Lutheran Party, the German reformer went on the attack, even going so far as to question Erasmus’ faith. As a result, Erasmus was hated by both camps. The Reformers complained that he retained too much of the Catholic ways, while the Pope and the cardinals accused him of trying to destroy the church. All of this was greatly troubling to Erasmus. He believed that one should live in the peace of Christ, that conflict should be avoided and a person should be on good terms with everyone, even those with whom he disagreed. Unfortunately, as is often the case, his opponents on both sides regarded this as fence-sitting and tried to force him to take sides. He refused. When the church formally blamed him for starting “the tragedy” (the Roman Catholic euphemism for the reformation), he fled to Basel from the Catholic town of Louvain to escape being burned at the stake. When Basel officially “reformed” in 1529, he gave up his residence there and settled in the imperial town of Freiburg im Breisgau. Considering that Erasmus was so much in the centre of the Reformation controversy -- literally -- it’s interesting that he is largely ignored when the subject is studied and debated. Which, ironically, is probably just the way he would want it. Erasmus’ Greek New Testament, which played a key role in the story of the Reformation, was published on February 1, 1516 – 491 years ago this week. January 28, 1906: In Toronto, Ontario, sixteen year old Oswald Smith accepts salvation through Christ at the final meeting of a campaign held by evangelist R. A. Torrey at Massey Hall. “There was no excitement, no unusual feeling, but I knew that something had happened and that ever after all life would be different”, Oswald said calling it the greatest event of his life. In 1921 he founded his first church, the Alliance Tabernacle, and he later became pastor of the People's Church of Toronto, one of the largest Protestant congregations in the world . January 29, 993: St. Ulrich, who lived c.890-973, and was Bishop of Augsburg from 923, becomes the first individual in Roman Catholic history formally elevated to sainthood. He was canonized at a Lateran Synod by Pope John XV. January 30, 1912: American Evangelical theologian, philosopher, and Presbyterian pastor, Francis Schaeffer, is born in Philadelphia. Most famous for his writings and his establishment of the L'Abri community in Switzerland, he was opposed to theological modernism, promoted an orthodox Protestant faith, and blamed the rise of relativism for the decline of Western culture. January 31, 1686: King Louis XIV of France, having already revoked the Protestant-tolerating Edict of Nantes, orders all Waldensian churches burned. The Waldensians, members of a pre-Reformation tradition that stressed love of Christ and his word and a life of poverty, were soon devastated: 2,000 killed, 2,000 "converted" to Catholicism, and 8,000 imprisoned. January 2, 1245: Giovanni da Plano Carpini, a sixty-year old Franciscan friar, is sent by Pope Innocent IV to carry a message to Genghis Khan. The message warns the great Mongol leader not to invade Europe or risk facing divine wrath. Khan’s reply required the Pope to appear before him in the royal court with the following warning, "If you disregard the command of God and disobey Our instructions, We shall look upon you as Our enemy. Whoever recognizes and submits to the Son of God and Lord of the World, the Great Khan, will be saved, whoever refuses submission will be wiped out." Though Europe lived in fear of invasion for decades, it never came.